IT'S A WONDERFUL LIFE (1946). " 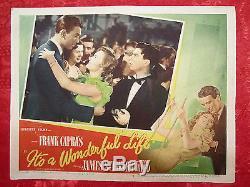 CLASSIC FRANK CAPRA FILM & CLASSIC CHRISTMAS MOVIE - AMERICANA HISTORY MASTERPIECE ". An angel helps a compassionate but despairingly frustrated businessman by showing what life would have been like if he never existed. 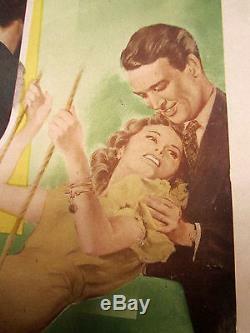 The film stars James Stewart. A man who has given up his dreams in order to help others and whose imminent suicide on Christmas Eve. Brings about the intervention of his guardian angel. Clarence shows George all the lives he has touched and how different life in his community of Bedford Falls. Would be had he never been born. 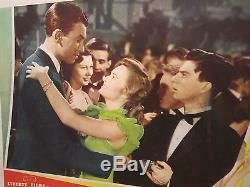 DONNA REED/JAMES STEWART/CARL (ALFALFA) SWITZER featured on this rare and original #6 lobby card. If additional photos are needed of item please let me know. Please excuse my poor photos I do not have the best digital camera. The lobby cards are clear and sometimes a glare is featured on the card that does not exist! Lobby Cards are no longer used in U. Theaters and are rarely produced for todays films. These highly collectible movie posters (usually 11x14 unless it is a jumbo lobby card is stated which measures 14 x 17) were generally produced in sets of eight, although the number of cards in a set can vary from as few as four to as many as 16. Many consider the TITLE CARD as the most collectible card of the set. Here is an unique opportunity to personally own a piece of cinema history! A piece of movie art that was sent to the theater to display in the theater to promote the film to the public. CONDITION DESCRIPTIONS no lobby cards are folded! Mint (M) is a poster or lobby card that has never been used or displayed. May show extremely minor signs of age. Folded posters may show very minimal wear at the folds due to storage. The posters should have no holes, no tears and no paper loss. Near Mint (NM) is a poster or lobby card that appears fresh and may show only small about of handing wear from being in storage all through the year, nice saturated colors. Folded posters may show very minimal wear at the folds. Fine Plus(FP) is a poster or lobby card with bright color and a clean overall appearance. It may have one or more general signs of use such as slight fold separation, fold wear, pin holes, or very minor tears, very, very tiny paper loss on corners. Fine (F) is a poster or lobby card with good color and a very presentable overall appearance. It may have small tears, pin holes, minor stains and some minor fold separation and minimal scratches. Very Good (VG) is a poster or lobby card with either bright or only slightly faded color and presentable overall appearance. It may have some paper loss, staining, writing in unobtrusive places, tears, pin holes, fold separation and tape supporting the back of the poster and minor scratches. Good (G) is an average poster or lobby card showing general signs of age wear, which may have some color fading, paper loss but nothing major, minor staining, minor writing, minor tears, pin holes, fold separation, tape, tape stains, signs of aged paper and scratches. Fair (FR) is a below average poster or lobby card showing significant signs of use and age, which may have some color fading, paper loss, staining, writing, tears, pin holes, fold separation, tape, tape stains, signs of aged paper and definitely needing significant restoration. This is NOT a reproduction copy or reprint. Please be aware that my digital camera image may differ slightly from the actual lobby card quality due to exposure/lighting/focus. The item is better than featured! I look forward to hearing from you. The item "IT'S A WONDERFUL LIFE 1946 JAMES STEWART/DONNA REED #6 ORIGINAL LOBBY CARD" is in sale since Tuesday, July 14, 2015. This item is in the category "Entertainment Memorabilia\Movie Memorabilia\Lobby Cards\Originals-United States\1940-49". The seller is "sherrybcollections" and is located in Indianapolis, Indiana. This item can be shipped to North, South, or Latin America, all countries in Europe, Japan, Australia, China, South Korea, Indonesia, Taiwan, South africa, Thailand, Hong Kong, Israel, New Zealand, Singapore, Saudi arabia, United arab emirates, Qatar, Kuwait, Bahrain, Malaysia.